North Road is one of the main thoroughfares on Gabriola Island, linking the ferry terminal directly with the Village Core. Due to this direct link to the stores, businesses and other community destinations, it is a busy road and currently offers little separation for cyclists or pedestrians passing through. The community has explored and expressed interest for a connecting trail within this area. The RDN has recently retained the services of Topographics, a local Landscape Architecture firm on Gabriola Island to undertake the design work for a new trail along North Road, between the junction of South Rd and North Rd and Tin Can Alley. It is anticipated that the trail will be located within the Ministry of Transportation and Infrastructure (MoTI) road right-of-way along the 1.4km stretch. Funding for trail design is through the federal Community Works Funds. Projects within the region's Electoral Areas that will improve public infrastructure and reduce greenhouse gas emissions are eligible to receive these funds. 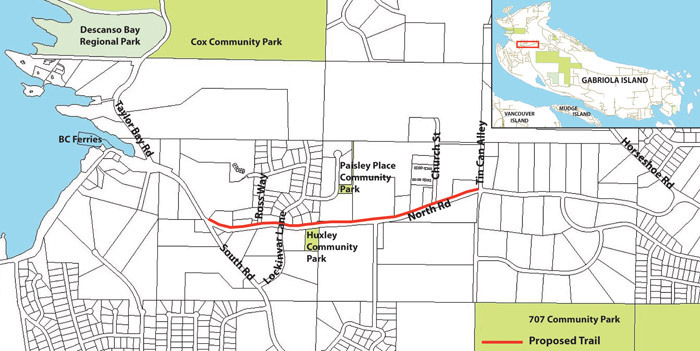 The Gabriola Village Trail will serve as a safe and enjoyable non-motorized corridor, linking Gabriola's Village with nearby parks, the Gabriola Commons, the Elementary School, and other community destinations. Trail design began in January 2014 and is still underway. Consultants and RDN Parks are working with the Ministry of Transportation and Infrastructure to finalize design drawings prior to construction. 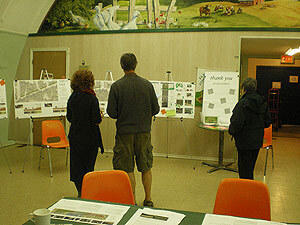 An Open House for the project was held Saturday, March 29, 2014 from 12:00pm to 3:00pm at the Agi Hall on Gabriola Island. Well over 100 people attended the event to learn about the Village Trail and share their ideas. This event was combined with concurrent work underway for Huxley Community Park. The preliminary Concept Plan (20MB) is also available. The Concept Plan will be revised based on input we have received from the community and in collaboration with the Ministry of Transportation prior to the preparation of construction drawings. Questions or comments about the proposed trail?